My spouse has been dreaming of re-visiting one of his childhood summer vacation places he enjoyed each and every summer. Due to me not being a fan of bugs, he opted to go the first half of June. The above are the temperatures we were looking at camping in. Yes, this was going to be an adventure! The canoes are loaded and we are ready to get paddling. The water looks beautiful but it's freezing! James brought solar panels. They worked nicely. We had island camps. This was one of my favorites. On Monday June 10th, we had begun the journey back out. Around 5pm, we pulled into the only available campsite which also happened to be a not so nice campsite being on a rocky slope with little level space. We weren't there long when I had a mis-step on a mossy wet rock. My foot slipped plunging me down the slope as I heard a series of CRUNCH CRUNCH which was my tib/fib shattering. I was now in serious trouble as we were still a day away from civilization and cell phone connections with five more portages to do. There was no way I would be able to get out on my own. Another camper gave him a Sam splint that might be of use. Another said they'd be going past a Ranger station in about six hours and would leave word of the emergency. As the above was going on, my Firefighter:EMT spouse James was assessing my situation and trying to keep me from going into shock. Even the slightest move caused me agonizing pain. I did go into a bit of shock from it so James got me off the ground by slipping the life vests under me and bundling me in an emergency blanket. He then built a shelter over me while my son kept me calm and breathing to help prevent further shock and control the pain. .
James and George were amazing! As James went into Emergency Rescuer mode, George followed his lead and kept me calm as he sat by my head and sang to me when the spasms were so bad I forgot to breathe and read to me till late into the night. George monitored me so James could do other things to better prepare for all of our needs. James would come by frequently to check my vitals as he worked to prepare a better shelter against the coming storm. Even had we been able to call for help ASAP, it was going to take awhile to get help in. James came up with the idea of writing out a short text message with our situation and location, then hitting send, then taping his phone on to his DJI phantom quad copter and then he flew it straight up about 1000 feet and held it there for 30 seconds as he hoped the text would go. 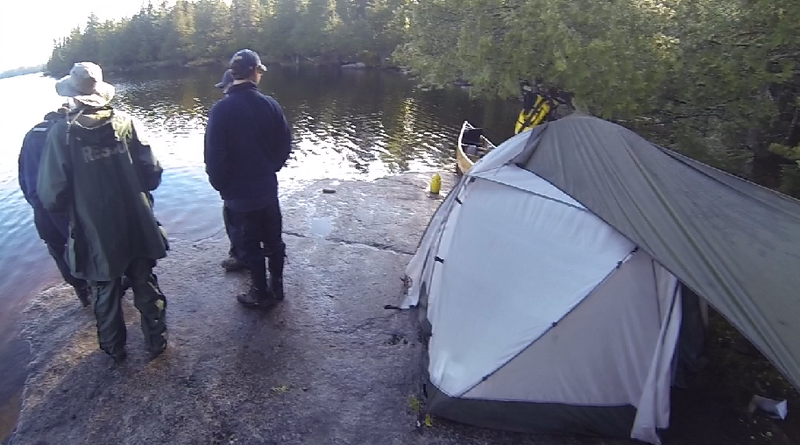 My spouse set up a tent on the edge of the lake, on a flat rock inches above the water and a few feet down from where I was. He was able to cut my boot into a splint and he helped me slide into the tent just before the storm arrived. It was a long cold painful night as I prayed someone received the call for help. My spouse was finally able to rest after securing the canoes between us and the lake. Think of them as a form of early alarm system should the waves come our way as we were inches above the water level. Sunrise in the boundary waters is about 5 am. As I saw the first lights appear, I prayed someone would come as the pain was extreme. 4:48am we heard the voices of the rescue team!! Four volunteers had gathered at 9pm to prepare for my rescue. They headed into the river at 1:30am, in the dark, in the pouring rain, in a thunderstorm. In just two canoes with their equipment. One even missed one of the portages and had to navigate the rapids in the dark, in the pouring rain and thunderstorm! What brave men! The rescuers who paddled in and the tent I was in waiting to be rescued. When the rescuers got there, they were amazed at the great job my spouse had done preparing me for the journey. 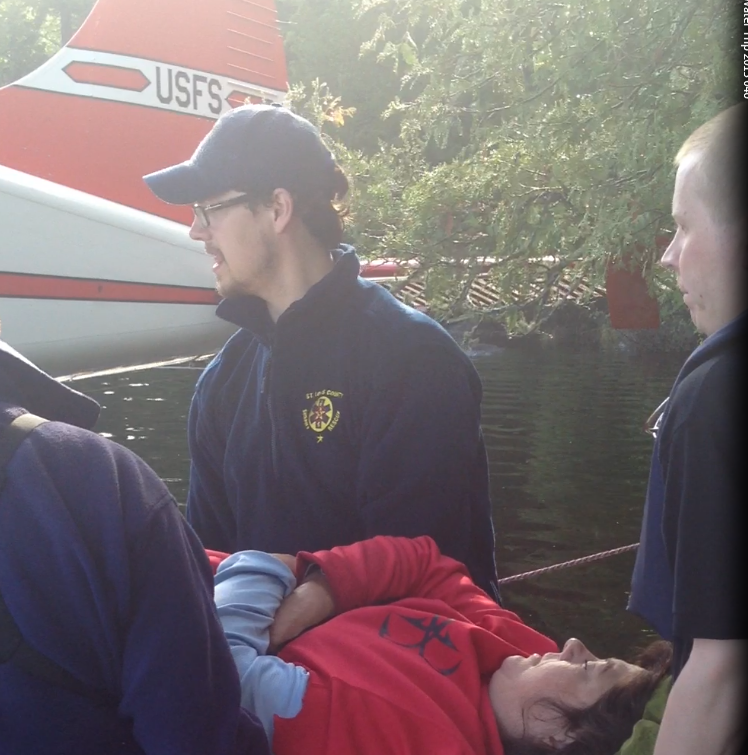 They splinted my leg all the way to my hip and with a few Tylenol on board, I finally fell asleep while we waited for the seaplane. 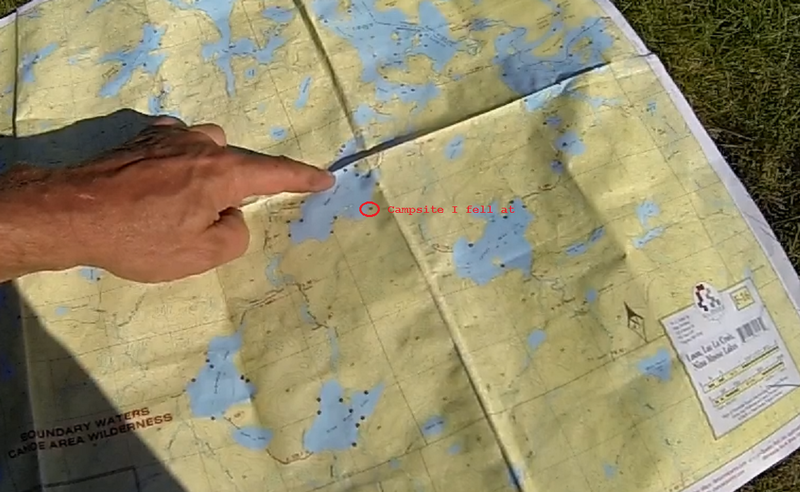 By 7am, the seaplane was making an epic landing on Lake Agnes in the boundary waters. They carefully navigated the rocks as I watched the wing pass over the tent on the rock, on the edge of the lake, that sheltered me. 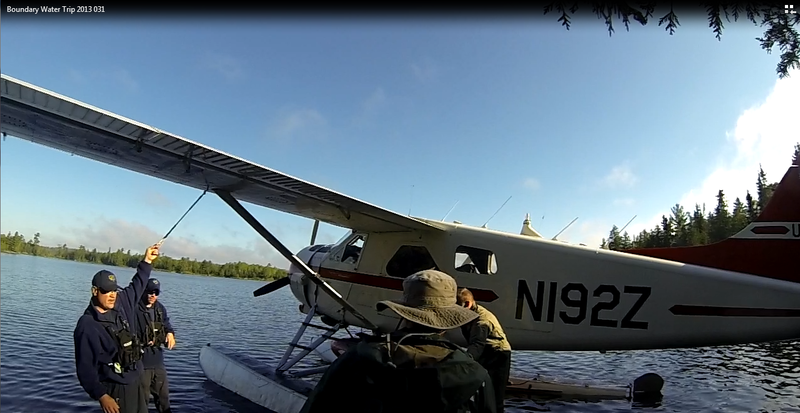 I was placed on a backboard then placed in the seaplane for transport back to civilization. The Doctor was waiting. They gave me pain medicine and I recall hearing her giving the x-ray techs permission to take pictures as needed. Look as they go and snap as they see fit. Those techs were awesome! My bed was spun and things moved but they never caused me a moment more of pain by manipulating my leg. The look on their face was scary. The more pictures they took, the more concerned they appeared. Once they were done, I suggested they help me move my leg and they both threw their hands up and said, "NO!" That's when I realized that my leg was in really bad shape, worse then I thought. I'm not sure how long the trip actually took as it felt like we were traveling as fast as possible on some precarious roads. The average trip takes two hours. Anyway, they got me safely to the Duluth Hospital (Need to find correct name here, too) and I was taken immediately to see the surgeon. He talked to me, advised what had to be done, got my permission to do it, and initialed my foot. Off I went to surgery. I woke up in a hospital room with my leg in my Stormtroopers cast. My nickname for it. The staff took excellent care of me while we waited for my family to paddle and portage out of the Boundary Waters with one less person to help. They arrived the following evening to pick me up and head to Minneapolis so we could fly home the following day. I'm home now, being cared for by my wonderful husband and son. 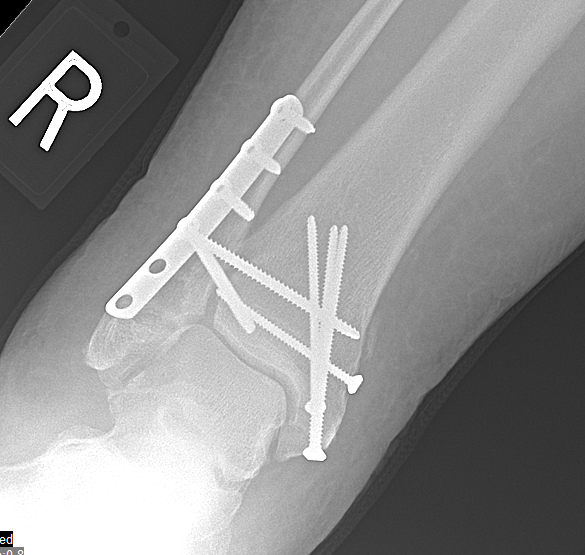 This is an X-Ray of my new ankle hardware. Oh! My! Gosh! Thanks for sharing your amazing story. You have some good material for a book now! Oh, that's a lot of things in your leg now! An amazing story! 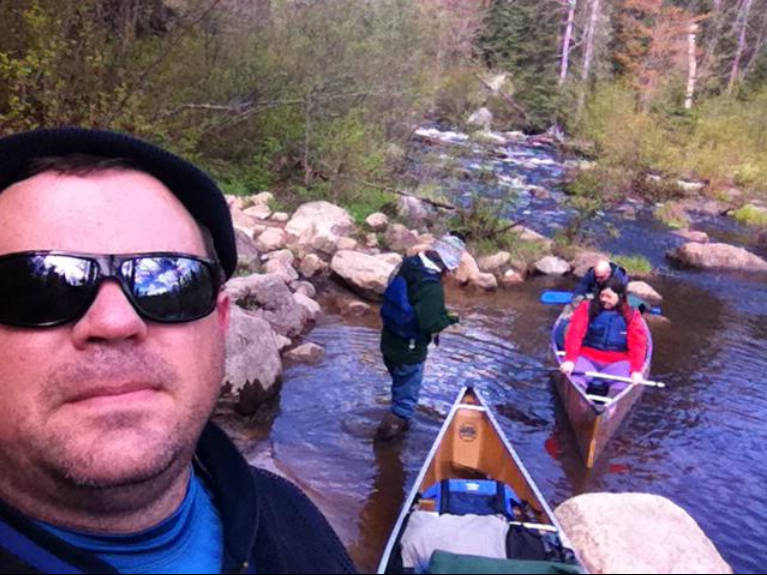 My family and I have often taken wilderness canoe trips just like yours into northern Quebec. Never had a problem like you did, only a little hypothermia.... Thanks for sharing, and the pictures are great, reminded us of our adventures. Be well! Sorry your trip to Minnesota didn't go as planned but you did get to experience "Minnesota Nice"! Great story. Glad everything worked out. Taking some scouts there on Monday. Did you ever find out how your rescuers found out you were in trouble? Was it the text message sent from the Quad Copter? Yes, we learned that the rescuers had gotten the spot but since it was moving, it was considered bogus. They figured someone had accidentally activated it as spots are to stay stationary. That particular spot we were given was also one of the least expensive so just a spot. We've since learned that you can get them with texting capability where you send the message via your phone and bluetooth. 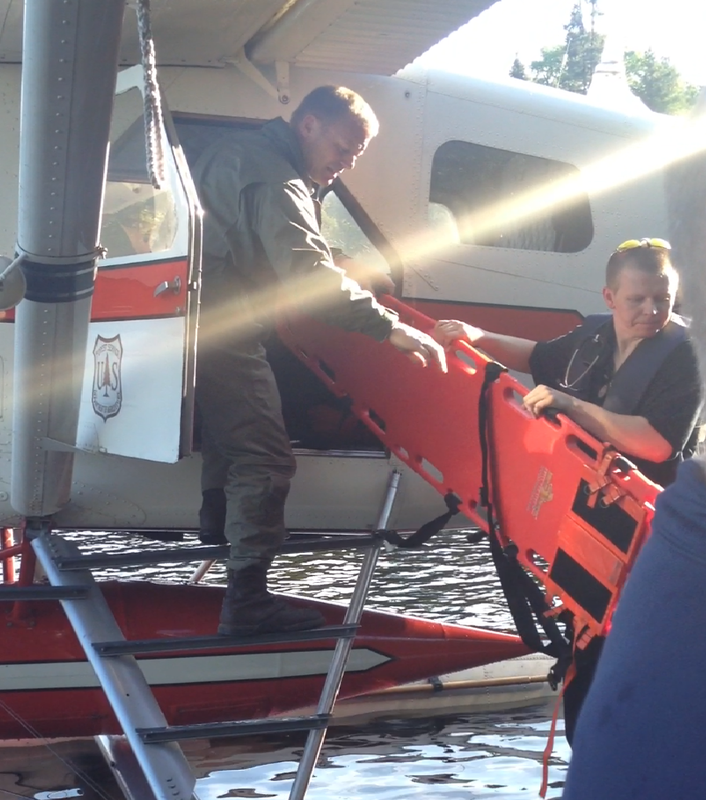 It was the text message sent via the quad copter to our outfitter that got the rescuers to respond. They advised us that once they knew I had broken my leg, they couldn't chance waiting for morning as the delay might have my group attempting to move me. In the future, I plan on just carrying a satellite phone when we venture into the wilderness. It's far less stressful knowing help can be reached. I hope the scouts and you have a wonderful time. Stay safe and have fun!